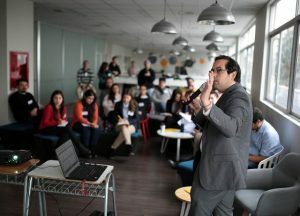 28 representatives from different institutions across Chile participated in the “Enterpreneurship Educators Program” (EEP) organized by the Wadhwani Foundation at La Fabrica, the coworking space for students at Universidad Mayor’s Manuel Montt Campus in Santiago. With the goal of strengthening entrepreneurship and teaching methodologies to entrepreneurs, the EEP introduced participants to Wadhwani Foundation’s platform for online learning and entrepreneurship tools. The program also encouraged participants to implement the methodologies on their own campuses.